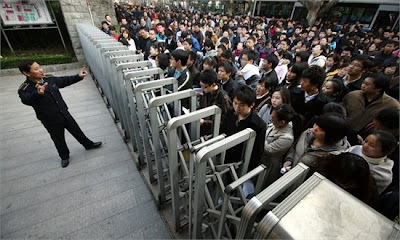 This is happening in China only. Majority of young graduates do not wish to work for their governments in their countries. Chinese young graduates adore to work in government sectors more than working in private sectors. REASON... It's not because of good salaries but simply because of the job security and better benefits offered. Last week Wang Zhong was just one of a million but he's hoping, yet again, to become one of this year's lucky 18,000. Wang, 34, took the national civil service exams for the fifth consecutive year in the hope of finally landing a stable, cushy job with a central government department. He had failed to pass the test three times and made it to the interview stage just once before flunking out at that level too. The national civil service exams, or guokao, held on November 27, attracted 970,000 test takers who are vying for just 18,000 positions that are available for open recruitment. With jobs potentially available for just one in 54 of those who write the test, Wang tried to maximize his chances by applying for a job with the Department of Rural Economy & Management under the Ministry of Agriculture. His four failed attempts were for jobs with various departments with the General Office of the Central Committee of the Communist Party of China. Wang's not sure how he did on this year's exam - the results aren't out yet - but he's hoping he can finally meet family expectations which keep pressuring him to keep trying. The brass ring he's reaching for comes with a lot of prestige even if the job he might get lands him near the bottom rung of the rank and file. The national public service exams were started in 1994 but many people see them as a reincarnation of the ancient imperial exams, which if passed would result in a summons from the emperor to join his court. The modern day exams are designed by the central government to find the best of the best test-takers and to provide an "in" to those who are complete outsiders to government. Wang has a mixed bag of sometimes contradictory reasons for wanting to join the national civil service. "It fits my personal ambition and I would acquire social status. It would also give me a stable income and a lifestyle without stress," said Wang. Wang has worked for lower levels of government for five years and in September he landed a job with the Guangzhou Urban Redevelopment Office in Guangdong Province. Still he feels his dream job exists somewhere in the vast bureaucracy of the national government. "I'm satisfied with my current job but it's still far from my expectations such as being close to power and working conditions," said Wang, who believes working in a national government office will provide job satisfaction even if he ends up in a mundane position without much room for advancement. "There is nothing special about being an ordinary government worker and it doesn't mean leading an official's extravagant life," said Wang, adding that it's important for new government workers to keep their heads down, not make waves and not be in a hurry to be promoted. Li Bing, an undergraduate who graduated from China University of Political Science and Law in 1999, is also trying to get into the "system" and took last week's exams. After 12 years in the private sector, 33-year-old Li said his parents pressed him into taking the exams for the sake of his future "stability." He quit his last job a year ago so he could prepare for the exams and help a friend with his business. For the last four months, however, he's concentrated on studying for the big test. He bought text books and the previous year's tests which he thought would provide good examples of the types of questions he would face. Li didn't enroll in any of the many available and costly courses that teach civil service candidates how to pass the national exams. Zhonggong Education claims it trained 50,000 exam takers this year up 20 percent from last year. The private trainer offers courses costing between 300 and 20,000 yuan ($46 and 3,092). Zhonggong's CEO, Li Yongxin, said his company has taken up 50 percent of the training schools market across the country. Li says 75 to 80 percent of those who enroll in his courses are recent university graduates and that 15 to 20 percent pass the test and land government jobs. He says people's ideas about career advancement are changing and landing a government job started to become more popular in 2007. "In the past, studying for a master's or PhD was valued, but now a job with security is seen as the best choice," said Li. Despite his prepping efforts Li the test taker isn't all that confident he'll pass onto the next stage in the employment competition and get called for an interview. He said the multiple choice questions on this year's test seemed more difficult than last year's. Li thinks he passed the essay writing section, which asked him to write about hot social topics. Exam takers are required to answer 135 multiple choice questions during the two-hour aptitude test which includes questions on logic, math and legal knowledge. The two-and-a-half-hour essay section asked questions about controversial issues covered by the media over the last year. Li said this year's writing section included questions about the fake paintings of Xu Beihong, the debate over food safety standards and an old woman who fell. Even before they took the national exams, potential candidates for government jobs had to meet the criteria established by the department offering a job. Li applied for a law-related position with the State-Owned Assets Supervision and Administration Commission of the State Council (SASAC), which has only one position that it intends to fill from those who pass the exams. "It's quite incidental that I applied for this position," said Li, who studied both computer science and law, but only obtained his bachelor's in law. Li's work experience includes stints with IBM, Fancrown Electronic Technology and other large companies but he believes his dream job lies within the central government's bureaucracy. Li was also qualified to take the exam for a position with the Administration of Sport of China, but chose SASAC as it required only a Bachelor's of Law and two years' work experience. Some of the positions available to those taking the national exams don't require membership in the Party and are open to college graduates who have completed work assignments such as the "village official" program which sends grads to remote places to work with local officials for a couple of years. If he ever manages to land a job in the central government Wang said he has a strategy that will keep him there. "What counts is developing a relationship with a boss who is on the rise. You must be obedient and cooperative. Promotions aren't dependent on one's own effort," said Wang. Wang's ideas about how to succeed are widely held by many who believe good marks on the national exams won't guarantee advancement. Even Professor Zhu Lijia with the Chinese Academy of Governance sounds cynical about how promotions are handed out and work performance awards are granted. "I'm a model worker and a bonus winner, so why do I need to be good" at my job, said Zhu, referring to the slacker attitude of many government employees. Zhu wants to see the government run more like a meritocracy where promotions are based on job performance and seniority and those who are motivated and have innovative ideas are rewarded. The national civil service exams have been in place for 17 years and Zhu says it's a relatively fair method of recruiting new blood into government even though the chances of landing a job have gone from slim to slimmer. In 2002, one in 13 exam takers were able to secure a government job. That ratio dropped to one in 35 by 2005 and will likely be one in 59 in 2011, according to a CCTV report. Zhu says there are several factors for the increasing popularity of the national civil service exams. While the pay may not be that great, there is job security as few people who get "in" are ever forced out. There are also benefits and perks; a pension plan that's better than most, along with health and welfare benefits that can include housing. Still it seems the prestige of working for a department connected to the nation's government remains a key attraction. "Many people don't adore businessmen or professors," said Zhu. A slowing economy is not the only problem that Chinese policymakers face. With a dramatic rise in the number of those in higher education, many graduates are finding it tough to get the right job. In the last decade, the number of students leaving university has increased almost six-fold. While there are plenty of low-skilled jobs around, there are not enough jobs for graduates in the major cities, as Martin Patience reports from Beijing.